Just a few days earlier we'd had the shootings in Como Avenue and now police were called to a dramatic five-hour siege in Ardwick Street in Daneshouse after a man had been sighted with a crossbow and was allegedly firing bolts. The area was sealed off as police tried to conduct negotiations with a man in a terraced house with terrified neighbours trapped in their houses having to watch their cars being set alight. As large crowds gathered, armed officers, mounted police and dog handlers surrounded the house as the man threatened to fire. As the siege continued, furniture was thrown out of the house and ignited and as flames reached upstairs windows, officers became concerned for the safety of people living nearby. Supt Michael Griffin conducted the negotiations and he confirmed that it began around 3 p.m. when police went to make enquiries and ended around 7:30 p.m. when a 23-year-old man walked out and gave himself up. He appeared in court the following day where he faced charges of affray, using or threatening violence and conduct that would cause a person to fear for his personal safety and with damaging by fire two vehicles and being reckless as to whether life would be endangered. Despite a request from the defence, hardly surprisingly, he was remanded in custody for a week with a committal hearing set for February. Another man in his twenties was found searching the boot of a car by the car's owner. He marched him into the nearby Holy Trinity school and called the police. When he appeared in court he pleaded guilty to vehicle interference but denied breaking in and said he'd found the car with both the boot and the door left open. The man walked virtually free, being given a 12-month conditional discharge and £25 costs. Holy Trinity school might have become the drop in centre for car thieves but Holy Trinity Church was in a poor state. Blackburn Diocese, the owners of the building, were set to sell it to a Chorley based company for a nominal amount. The latest plan for the building was to convert it into low cost accommodation. It was congratulations to one Burnley couple, Charlie and Gertrude Ashworth, who were celebrating their diamond wedding. The highlights of the day for them were receiving a telegram from Her Majesty The Queen and being taken out for lunch by their family. They were asked for the secret to a happy marriage. Gertrude said: "We are lucky to have always had work and we've always saved for things we wanted." Charlie simply said: "I eat a lot of porridge." Police were called to the Borough public house in Burnley at 11:25 p.m. when the licensee couldn't get people to leave. One woman demanded another drink but was told she was barred so attempted to drag the barmaid over the bar by her hair and punching her. She was promptly escorted out screaming: "If I'm getting barred, I might as well get barred for something." Burnley folk were turning up with their dogs for auditions. BASICS, which was the young people's section of Burnley Light Opera Society were staging 'Annie' and were auditioning for the part of Sandy. The only stipulation was that the dog had to be sandy in colour and also of a gentle nature. Auditions had to be suspended when a dog fight started. On the entertainment front, the Mechanics had pulled off something of a coup with the booking of both Phil Cool and Frank Skinner for four nights in February. It was expected there would be a big rush for tickets with all four nights set to be sold out. Burnley Football Club had good news too ahead of the big cup tie when right back Ian Measham finally signed a new contract. Measham had been in dispute with the club and had been on a week to week deal since his last contract had run out in the summer of 1991. He'd signed for Burnley early in the 1988/89 season and. having settled his differences with the club had committed himself to Burnley for a further two years. Burnley were facing a difficult tie against Derby County but Jimmy Mullen said ahead of the game: "Cup football is all about shocks and surprises. Derby are really a First Division club with a First Division set up but when you look back at our game against Manchester City last season you can see we are going to have nothing to lose. "There will be a big crowd and a great atmosphere and our pride will be at stake." Mullen had to make one enforced change to the Burnley team. Adrian Randall was cup tied having played in the first round for Aldershot in a 1-0 home defeat against Enfield and that allowed Steve Harper to return to the starting eleven with Mark Yates taking Harper's place on the bench. Burnley got off to the worst start possible, going behind with only 32 seconds gone, but the Clarets then thrilled a near-capacity crowd with a performance that was worthy of a place in the fourth round. We turned in a terrific performance that had the crowd in a frenzy, but Derby were a good side and all in all it proved to be a superb cup tie with some real excitement. Right from the kick off Derby won a throw in on the left taken by winger Ted McMinn. He played the ball forward to Mark Stallard. 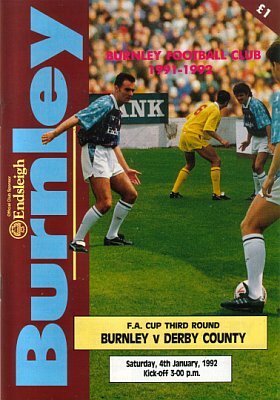 He got past Measham and then Steve Davis before crossing a perfect ball for Martyn CHALK to head home past the helpless Mark Kendall, who was making his home debut for Burnley. It was exactly what we didn't want but far from letting our heads drop we took the game to Derby and on six minutes fashioned an equaliser of real quality. John Francis won the ball for Burnley in the centre circle and played a delightful ball for Roger Eli down the right. Eli was simply brilliant as he got down the flank and behind the Derby defence before crossing low where HARPER stole in to beat Peter Shilton at the near post. Burnley really threatened to take the gamel by the scruff of the neck and played some terrific football. Harper came close again whilst Andy Farrell saw a shot charged down at the last minute. Defensively we were marshalled by the immaculate John Pender and the only problems were coming from the left wing where McMinn was showing off all his skills. With around 15 minutes to go we thought we'd won it with a Davis pile driver but Shilton showed all his quality to get down and save. Then disaster struck. Derby won a controversial free kick down the left wing. McMinn took it and it deflected off a defender which led to Kendall not being able to hold on to it. Stallard failed to convert but the ball fell for Andy COMYN who gave them an undeserved lead. Derby didn't have another attack in the game as Burnley threw everything at them and once again we quickly drew level with a goal that bettered our first. Harper and Jakub linked up with Jakub playing the ball down the left flank for Conroy. The striker tore down the flank and volleyed the ball across for ELI who thumped a header home from six yards that was so powerful it is unlikely that Shilton saw it let alone came close to saving it. For the remainder of the game Derby were hanging on and twice had to thank Shilton for keeping the scores level. In the end it was 2-2 and set Burnley up for a trip to Derby in the replay. Davis, who had played so well alongside Pender, said after the game: "It was end to end stuff from the start. We got caught cold in the first minute but I thought they were a bit lucky with their second goal. The referee had waved play on and the linesman flagged it." 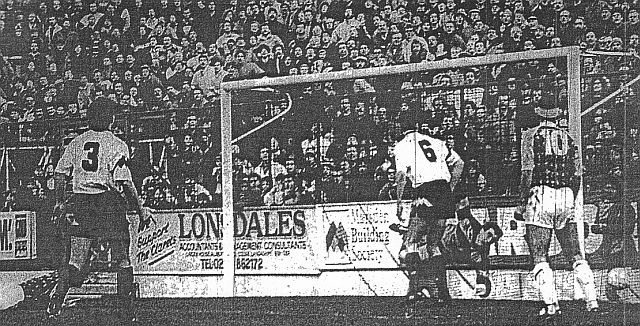 He was pleased with how he and Pender had dealt with the big striker Ian Ormondroyd but was not so complimentary about Derby's left winger McMinn. When asked about his performance, Davis said: "He's a tricky player but I thought Ian Measham played him well. Ian got some good tackles in but I think he's a cheat, McMinn. He cons referees." Burnley learned that, should they win the replay, they would face a home tie against either Aston Villa or Tottenham Hotspur in round four. Burnley: Mark Kendall, Ian Measham, Joe Jakub, Steve Davis, John Pender, Andy Farrell, Steve Harper, John Deary, John Francis (Graham Lancashire 78), Mike Conroy, Roger Eli. Sub not used: Mark Yates. Derby County: Peter Shilton, Mark Patterson, Michael Forsyth, Geraint Williams, Simon Coleman, Andy Comyn, Martyn Chalk, Ian Ormondroyd, Mark Stallard, Paul Williams, Ted McMinn. Subs not used: Jason Kavanagh, Steve Hayward. 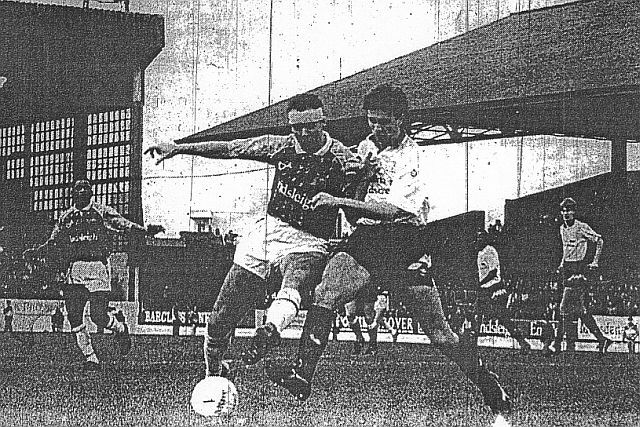 There were league games played too on the day with third place Mansfield Town winning 2-1 at York City to move up a place and within two points of us. Barnet dropped to third having had no game whilst fourth place Blackpool could only get a point at Maidstone United. The biggest shock in the league was bottom club Doncaster Rovers winning at Walsall but in the FA Cup there was a massive shock as goals from Mickey Thomas and Steve Watkin took Wrexham to a 2-1 win against Arsenal.